The chapel ca. 1890. To the left is the hermit and the peasant - then comes the start of the dance. In 1701 the old painting was in so miserable condition that it was necessary to replace it with a copy. 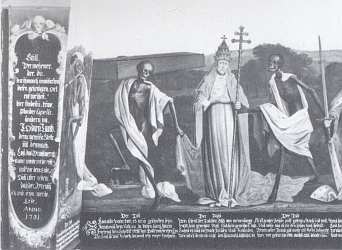 The new painting was executed by the church painter Anton Wortmann. 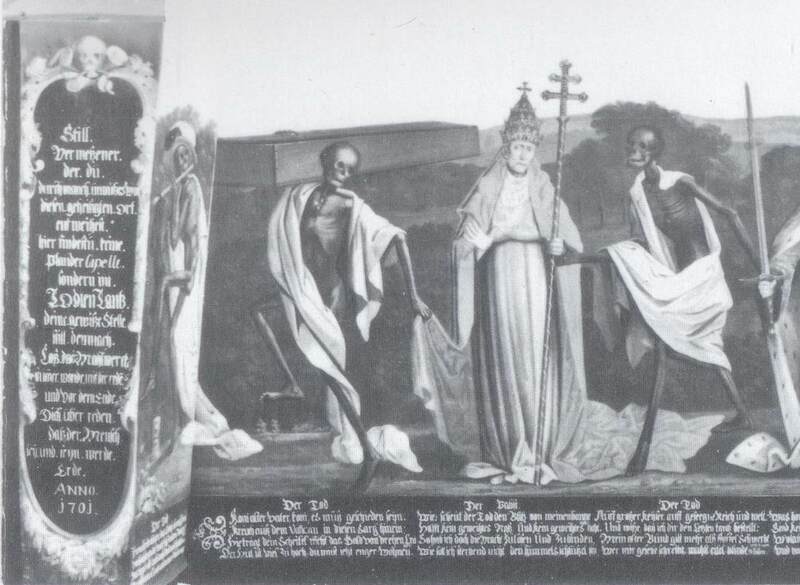 The new copy was mounted in the same frame as the old one, and generally Wortmann had made a close copy. Still, a number of changes were introduced, the most confusing ones where that nobleman and mayor had changed places in the dance (see note here) and the same with merchant and craftsman (see note here). Great parts of the old Low German text were illegible, so instead a new High German text was written by af Nathanael Schlott. The new text had nothing in common with the old one, and even the structure was different: The old text was "chained together" in the way that the 8th line of the preceding verse is Death's call to the next dancer, then 8 lines with the human's defense and 7 lines with Death's reply. In the new text, Death first speaks 4 lines, after which the human answers with 4 lines. The start of the dance. The painting starts with a stern admonition written by Schlott. 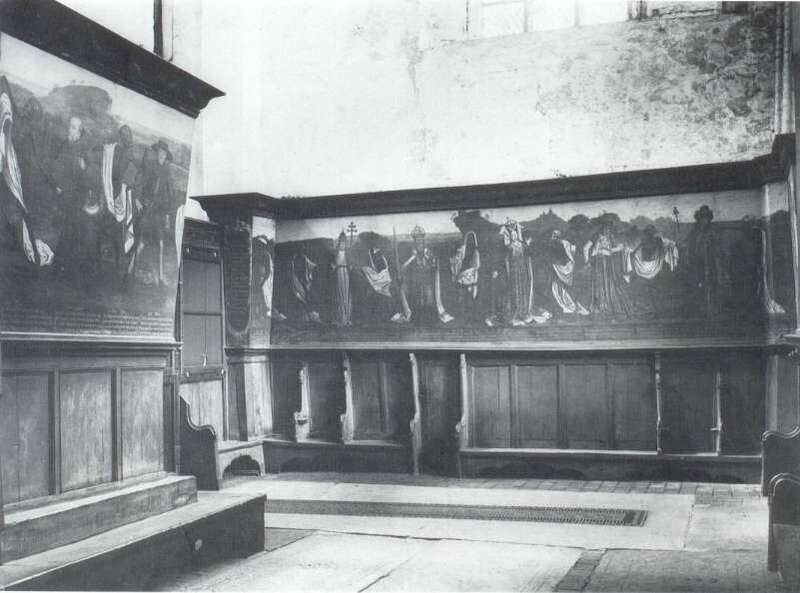 Presumably the old painting had a preacher in this place, just like in Tallinn and everywhere else. Then comes Death wearing a baroque plumed hat and playing the flute. The question if whether Wortmann invented only the hat or the entire figure. The preacher Jakob van Melle wrote down as much of the old text, as could be read. Unfortunately he created confusion for the next 200 years by presenting the old text with the same structure as Schlott's new text and in the same sequence as Wortmann's new painting. On the present site the High German text from 1701 is presenting along with copper engravings by Ludewig Suhl. Together with the high German text I include an English translation from Thomas Nugent's book: Travels through Germany from 1766. In the Danish version of these page I instead present a Danish translation by Lydert Höyer: Den Lybekske Dødning-Dantz from 1738. Click the thumbnails to see picture and text.